Explanation: Innermost planet Mercury and a thin crescent Moon are never found far from the Sun in planet Earth's skies. Taken near dusk on April 8, this colourful evening skyscape shows them both setting toward the western horizon just after the Sun. 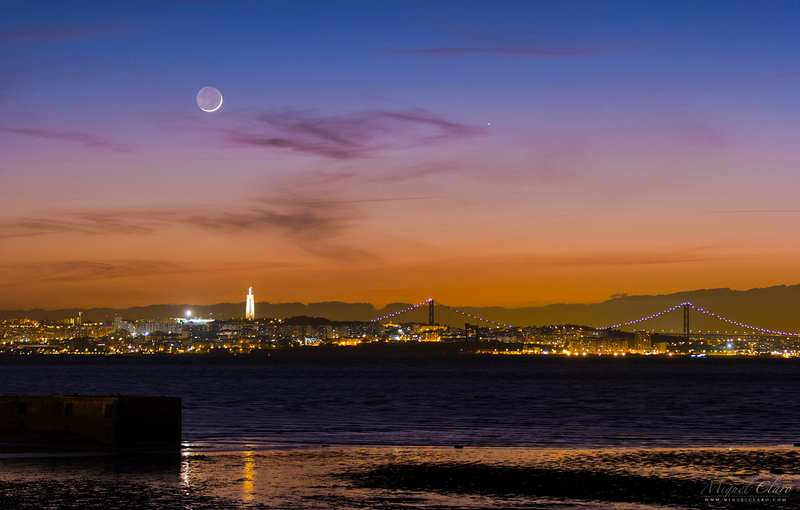 The broad Tagus River and city lights of Lisbon, Portugal run through the foreground under the serene twilight sky. Near perigee or closest approach to Earth, the Moon's bright, slender crescent represents about 3 percent of the lunar disk in sunlight. Of course as seen from the Moon, a nearly full Earth would light up the lunar night, and that strong perigee earthshine makes the rest of the lunar disk visible in this scene. Bright Mercury stays well above the western horizon at sunset for northern skywatchers in the coming days. The fleeting planet reaches maximum elongation, or angular distance from the Sun, on April 18. But Mercury will swing back toward the Sun and actually cross the solar disk on May 9, the first transit of Mercury since November 8, 2006.